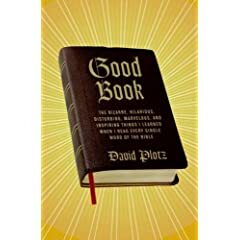 So anyway, in one of the shows, one of the panelists, David Plotz, mentioned (repeatedly) that he had written an interesting book called Good Book: The Bizarre, Hilarious, Disturbing, Marvelous, and Inspiring Things I Learned When I Read Every Single Word of the Bible, which is, well, self-explanatory. Everyone should read it—all of it! In fact, the less you believe, the more you should read. Let me explain why, in part by telling how reading the whole Bible has changed me. Check out his article on Slate on the book, where it is mentioned that Good Book is a culmination of a series of blog posts he did while reading the Bible from cover to cover. Make no mistake: A.J. Jacobs is not a religious man. He describes himself as Jewish “in the same way the Olive Garden is an Italian restaurant.” Yet his latest work, The Year of Living Biblically: One Man’s Humble Quest to Follow the Bible as Literally as Possible, is an insightful and hilarious journey for readers of all faiths. 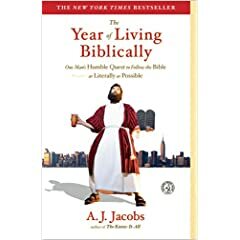 Though no fatted calves were harmed in the making of this book, Jacobs chronicles 12 months living a remarkably strict Biblical life full of charity, chastity, and facial hair as impressive as anything found in The Lord of the Rings. Through it all, he manages to brilliantly keep things light, while avoiding the sinful eye of judgment. 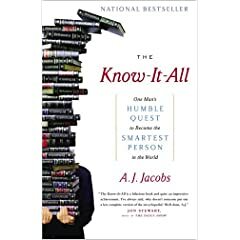 Jacobs is the author of The Know-It-All: One Man’s Humble Quest to Become the Smartest Person in the World, which chronicles his reading of the entire Encyclopedia Britannica, from A to Z. I’ve read The Know-It-All, and can confirm that it’s a hilarious laugh-a-minute romp through the fabled encyclopedia, told with a keen wit.